Anyone who lives in London has two concerns on a night out: whether they have to cross the river and whether or not the trains will be running late enough to return home easily. Being one of those types who lives in North London, my nights out in the southern side of the city have only ever ended one of two ways: either very early so I can catch the final train home, or very late because I have missed said train (Read: Christmas Eve 2007, when I walked 12 miles home to Highbury from South Wimbledon). But sometimes missing that final train home and having to string together a series of buses to reach your bed isn’t always a bad thing.This is exactly what happened following my trip to East Dulwich last week in order to try the food and wines at biodynamic and organic wine specialist Green & Blue Wines. Now, I have to say I’m lucky enough to have great shops like Highbury Vintners and The Sampler on my doorstep, while English wine specialist Wine Pantry and a Laithwaites outlet are near my office. I’ve always been polyamorous when it comes to wine shops, however, so I felt no sense of disloyalty making the trip down to East Dulwich after being invited there by Kate, the owner of this shop/restaurant/deli (full disclosure: this dinner and the wine were paid for by Green & Blue wines). Organics are something I became well-acquainted with growing up on Canada’s west coast, where it was impossible not to have a concern for green issues given it’s an area known for tree huggers and ardent recyclers. But shops like Green & Blue and all the others I buy from are a bit of a revelation for me. You see, I grew up in British Columbia where, if I wanted to buy alcohol, I had three options. I could shop at the BC Liquor Store where the stock was dictated by what would make an easy sell at each location, at a cold beer and wine store attached to a pub, or at a VQA wine shop, which sold only specialist wines made in Canada. So there I was in East Dulwich trying to find my way to Green & Blue. This isn’t a place you’ll have trouble finding. Situated in the middle of the high street, it occupies the width of two storefronts and is painted in a bright, lime green. If the objective was to be noticed, Kate scores full points here. Now, to the food and the wine. One thing I love is the idea of merging a wine merchant with a restaurant. This is something I admire about St John Bar and Restaurant, and have noticed popping up among other retailers. If you can do it well, it’s a fantastic plan. Forgive me now while I say very quickly the food was superb (and I really do mean it was fantastic and I would recommend it to everyone) so I can move on to the wine. 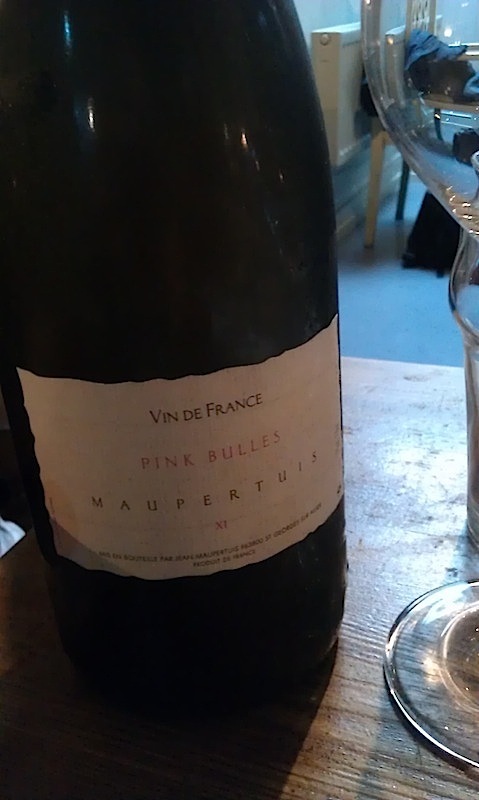 First up, Domaine Jean Maupertuis Petillant Pink Bulles. This is made from gamay grapes, comes from the Loire and is really just a simple and fun sparkling wine. There isn’t much complexity here; fizz and a medium-sweet flavour dominates. There is some nuttiness, strawberries and lots of fruits, but overall it isn’t a complex wine. This is something to drink very cold on the patio when the sun is shining. With our starter and the sardines I opted for the next wine on offer, a rosé from Rousillon. 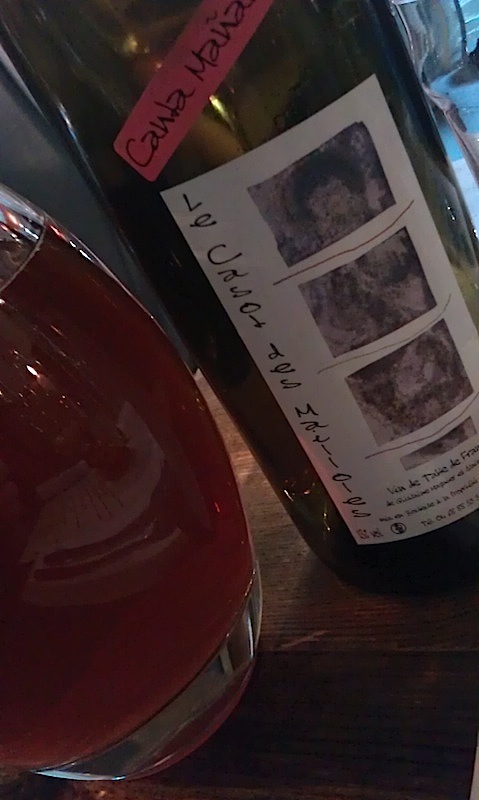 This was the Les Casot de Mailloles Canta Manana Rose 2010. Unfortunately this wasn’t showing at its best, but it was very perfumed with a lot of floral tones and red fruits. On first whiff it had the odour of a hair salon, which didn’t go over well, but I have to say it matched nicely with the food. I wouldn’t say I was totally in love with this wine, but I’d be willing to try it again to reassess. 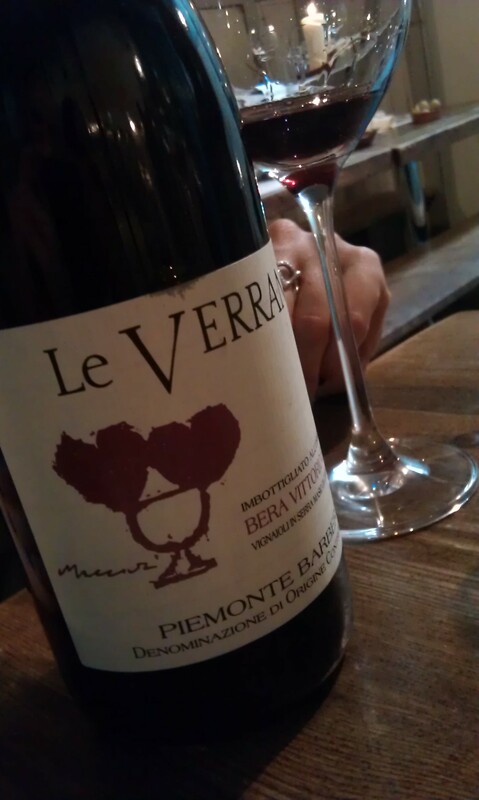 The wine to accompany the lamb shoulder was a very lightly fizzed Vittorio Bera Barbera Monferrato ‘Le Verrane’, which had that classic barbera flavour of cherries and berries, plus the acidic backbone to stand up to the meat. While the slight fizz is common to many Italian wines, I have to say I’d prefer it was completely still, but it was a good wine and definitely worth a try if you haven’t had this style before. Once we’d made it past these three bottles, I lost track of everything else that was going on. Another bottle of red came out, but sadly I have no photo of it or even a note to tell me what it was like. Events became a blur. Then when the pudding came out we had a glass of fino sherry to accompany it, but again there is no photographic evidence to back it up. What I do know is fino and dark chocolate can go together nicely even if you think it is all wrong, although I found it better to have a few sips of it rather than a full glass, otherwise the dryness of the sherry overwhelms the palate. Not only did I lose track of what we were drinking, but I also lost track of time entirely. By the time I’d hunted down and bought a bottle of Qupé Central Coast Syrah 2009 from Kate and walked out the door, it was midnight. And apparently at midnight in East Dulwich it is impossible to catch a train back to London Bridge, which meant I had to wait 15 minutes for a bus to take me north of the Thames, from where I caught another bus home. By the time I got to bed, it was 1:30 a.m.